Do you use varieties that have few seeds for making homemade sauces OR do you use a tomato strainer to remove skin and seeds OR a combination depending on variety? I use a food mill. Mine is a "Back to Basics" but is identical to the Victorio mill. The output is the juice and the meat of the tomatoes. The seeds and the skins are separated and come out the "waste" end of the mill. Using one of these "mills" completely eliminates the consideration of how many seeds a particular variety has. This allows you to concentrate on the taste. There are some threads here on these mills with pictures. It really is the only way to go. Thank you guys very much Ted and wildcat that is exactly what I needed to justify the purchase. Here is my process. Mind you I make salsa mainly and when I make sauce I still follow these steps but include a final step with the food mill. You can also roast peppers this way for skin removal. 1. Halve tomatoes and squeeze juice/seeds into a fine strainer for saving. 2. Lay halves cut side down in a glass casserole dish and broil for 5-10 mins in oven. 4. Throw in blender with other ingredients and puree/chop. 5. Optional- add back some of the seedless juice to get the perfect consistency. 6. Eat way to much salsa grinning the whole time. Thank you BVV, i love salsa as well and will try this method soon as well. 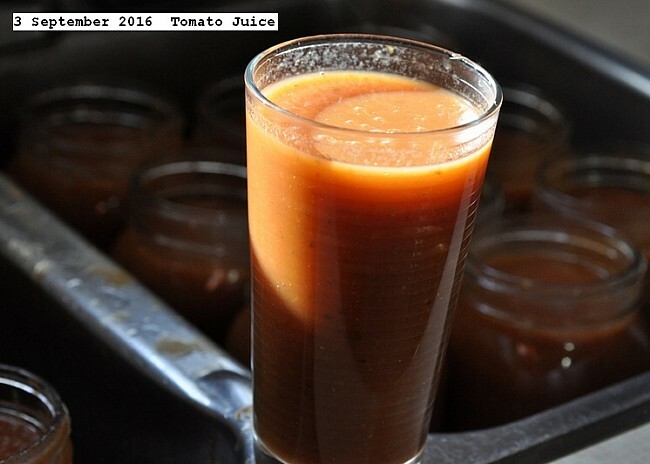 I process around 500 pounds each year of various tomatoes depending upon what grows well. I have a Victoria which is as leaky piece of junk IMO, so I use a simple food mill and work it by hand. The skins and seeds are removed. The juice may be reduced and spiced as desired for sauce. I simply drink it doing the year, which is around 150 liters. Forty five pounds of tomatoes with a few pounds of dill and parsley were made into 22 liters of pressure canned juice. One batch was mostly Sicilian Saucer tomatoes. There are two plants which are heavy producers. No water was added. The tomatoes were cooked in their own juice. Pictures depict the processing. No problem. I did all mine with the food mill for awhile but it was so labor intensive. My method works great for just a quart or 2 at a time and way less work than a food mill. I have all of these on hand minus the food mill so I can implement immediately, thanks. Sauce French word for salsa taken from Latin meaning salted. Not sure how I missed this one Durgan but that is some delicious looking juice. Sounds like you have a heck of an operation each year. I wish I could apprentice under Durgan for a year. Thanks for the tips. Made a batch of fresh pasta sauce w/ a mix of Wes and Iraqi Heart. Family loved it. I make and freeze pasta sauce from my fresh tomatoes. I core and then dip whole tomatoes in boiling water and then ice water to remove the skins. I squeeze the tomato over the sink and this removes most of the seeds and gel and then I rough chop the tomato's into a colander to drain for about 30 minutes. This gets rid of excess water and keeps my sauce from being watery. After draining for 30 minutes I make my pasta sauce with the fresh chopped tomatoes, onions, garlic, herbs, tomato paste, beef broth, vegetable broth and some Italian sausage. I still have some seeds in my sauce but I don't try to remove all of them. I freeze my sauce in mason jars.